Background There is growing evidence regarding the importance of contextual factors for patient/staff outcomes and the likelihood of successfully implementing safety improvement interventions such as checklists; however, certain literature gaps still remain—for example, lack of research examining the interactive effects of safety constructs on outcomes. This study has addressed some of these gaps, together with adding to our understanding of how context influences safety. Purpose The impact of staff perceptions of safety climate (ie, senior and supervisory leadership support for safety) and teamwork climate on a self-reported safety outcome (ie, overall perceptions of patient safety (PS)) were examined at a hospital in Southern Ontario. Methods Cross-sectional survey data were collected from nurses, allied health professionals and unit clerks working on intensive care, general medicine, mental health or emergency department. Results Hierarchical regression analyses showed that perceptions of senior leadership (p<0.001) and teamwork (p<0.001) were significantly associated with overall perceptions of PS. A non-significant association was found between perceptions of supervisory leadership and the outcome variable. However, when staff perceived poorer senior leadership support for safety, the positive effect of supervisory leadership on overall perceptions of PS became significantly stronger (p<0.05). Practice implications Our results suggest that leadership support at one level (ie, supervisory) can substitute for the absence of leadership support for safety at another level (ie, senior level). While healthcare organisations should recruit into leadership roles and retain individuals who prioritise safety and possess adequate relational competencies, the field would now benefit from evidence regarding how to build leadership support for PS. Also, it is important to provide on-site workshops on topics (eg, conflict management) that can strengthen working relationships across professional and unit boundaries. The objective of this paper is to examine the relationships (ie, direct and moderated) between staff (ie, nurses, allied health professionals (AHP) and unit clerks) perceptions of safety climate, teamwork climate and a self-reported safety measure. Safety climate was considered as senior and supervisory leadership support for safety. In addition, much of the empirical research in healthcare settings has primarily focused on safety-related behaviours of leaders such as participative leadership style,12 empowering leadership style,15 executive safety walk-rounds,16 17 adopt-a-work unit18 and front-line safety forums19 that can improve employees’ perceptions of safety climate. However, empirical support for the predictive power of staff perceptions of leadership on safety outcomes remains limited. Empirical studies that have examined such relationships suggest that presence of supportive leaders significantly improves staff outcomes (eg, decreased nurse burnout)20 and patient outcomes (eg, decreased falls, nosocomial infections, medication errors and adverse events).21 22 Only a handful of empirical studies have attempted to simultaneously evaluate the interactive impact of staff perceptions of senior and supervisory leadership on safety outcomes.23 There is a need for further empirical work to more deeply examine how different levels of leadership may influence safety. The research community has made important inroads in understanding the role of contextual factors in improving staff and patient safety (PS). However, the current study addresses several gaps that persist in the literature: (a) the need for more theory-based empirical research on safety-related contextual factors and a more focused definition of safety climate10; (b) a dearth of studies that examine the unique variance accounted for by multilevel perceptions of safety climate on a safety outcome23; (c) the need for empirical research that examines the main as well as interactive effects of safety climate on outcomes30; and (d) empirical research on safety and quality has primarily focused on understanding the perceptions of nurses while largely ignoring the perspectives of other healthcare professionals. Hypothesis 1: Perceptions of senior leadership support for safety and supervisory leadership support for safety will both be positively associated with overall perceptions of PS. Furthermore, these predictor variables will interact and significantly influence the outcome variable. Hypothesis 2: Perceptions of teamwork climate will be positively associated with overall perceptions of PS. Furthermore, teamwork climate and multilevel safety climate (ie, perceptions of leadership support for safety at the senior and supervisory levels) will have a significant interaction effect on outcome variable. The study was conducted at a large community hospital located in Southern Ontario (Canada). Survey data were obtained from front-line nurses (eg, registered nurses, registered practical nurses), AHPs (eg, respiratory therapists, physiotherapists, pharmacists) and clerical staff who worked on one of the four participating clinical units: intensive care unit (ICU), general medicine, adult inpatient mental health and emergency department (ED). Survey data were collected from all staff in the above roles who had worked for at least 6 months on one of the four participating clinical units. The exclusion criteria included anyone in a leadership role (eg, nurse manager) or anyone who was not in direct contact with patients (eg, clerical staff responsible for administrative duties such as booking appointments for a nurse manager). Survey data were collected between 30 September 2015 and 1 February 2016. During that time, the lead author visited each of the four participating units several times in order to recruit as many eligible full-time, part-time and casual front-line clinical staff as possible to complete a study survey. Non-probability convenience and snowball sampling procedures were used as it was not feasible to acquire accurate staffing numbers from the hospital/unit manager since casual staff were supplied by staffing agencies and assigned to a unit based on need. The on-site visits were spread across both the day shift and night shift so the researcher could meet and give surveys to as many eligible staff as possible. During each unit visit, a short oral presentation on the study’s purpose, inclusion/exclusion criteria, survey characteristics (eg, voluntary, anonymous, cross sectional), and so on was used to solicit staff participation. Surveys were handed out to only those clinical staff who acknowledged that they met the study’s inclusion criteria and were willing to participate in the study (four staff refused to take a survey). Respondents were asked to indicate the clinical unit they worked on; however, no individual identifiers were solicited (ie, survey data were anonymous). A drop box was placed on each participating unit to collect completed surveys. As a small inducement to participate, a $20 gift card raffle draw was held on the final day of data collection on each unit. A returned completed survey by a respondent was seen as his/her consent to participate in the study. The senior leadership support for safety, supervisory leadership support for safety, teamwork climate and overall perceptions of PS were all measured using a 5-point agreement Likert response scale (1=‘strongly disagree’ to 5=‘strongly agree’). All negatively phrased items were reverse coded so that a high score on an item corresponded to a high score on a scale. For each scale, a mean score was calculated if a respondent answered more than half of the questions in the scale. Clinical unit, tenure, gender and profession were all measured as categorical variables. Clinical unit contained four categories: general medicine, ICU, ED and mental health; unit tenure included three categories: 6–24 months, 2–5 years and >5 years. There were three categories for profession: clerical staff, nurses and AHPs, while gender contained two categories: male and female. See supplementary file 1 for the survey instrument used in the current study. All analyses were carried out using SPSS, version 22. Manual double entry of survey data was used to minimise data entry errors.34 Cronbach’s alpha values were calculated for senior leadership, supervisory leadership, teamwork climate and overall perceptions of PS to assess the reliability of these scales in the current data set.35 36 Demographic variables were transformed into multiple categorical variables (dummy variables) to use them in regression analyses. The categories of general medicine, 6–24 months, male and AHPs were used as reference groups. In order to test our study hypotheses, hierarchical regression analyses were used. Hierarchical regression analysis permits a researcher to examine the unique variance accounted for by a predictor, over and above the variance contributed by independent variables entered earlier in an analysis.38 Demographic variables are typically good candidates for the first step in a hierarchical regression analysis39 as they are static variables and should be entered in an analysis before the dynamic variables.38 Hence, unit affiliation, and then tenure, and profession dummy variables were entered in block 1 and block 2 of the hierarchical regression analysis, respectively. The three predictors (ie, senior leadership support for safety, supervisory leadership support for safety and teamwork climate) were entered in block 3, and their associated interactions were entered in block 4. All predictors with interactions were centred in order to avoid problems of multicollinearity.37 Significant interactions were plotted. Table 1 shows the survey response rate for the current study. A total of 245 surveys were distributed. Four eligible clinical staff who refused to take a survey were added to the denominator for purposes of calculating the survey response rate and two returned surveys from respondents who indicated they had worked for <6 months on their clinical unit were excluded yielding a final denominator of 247. The overall survey response rate was 74% (183/247). Response rates varied by unit (ED=67%; general medicine=92%, see table 1). It is possible that the 92% survey response rate on general medicine was facilitated by the physical space constraints of the unit—that is, presence of semiprivate patient rooms necessitated the charge nurse/unit clerk to ask all the staff to gather for a quick huddle when the primary researcher was on-site. These huddles made it easier for the researcher to build good rapport with staff and provided participants with an opportunity to complete the survey on the spot. Staff huddles were also conducted at other clinical units to help facilitate data collection but these occurred less frequently than on the general medicine unit. Most study participants were female (89.6%), nurses (79.8%) and had a tenure of greater than 5 years on the unit (54.1%). The proportion of nurses (79.8%), AHPs (9.8%) and clerical staff (7.7%) in our survey respondents was similar to their proportion in participating units’ full-time staff where 82.5% were nurses, 9.7% were AHPs and 7.8% were clerics—see table 2. Other demographic information for participating clinical units’ full-time nurses, AHPs and clerical staff was not available. Table 3 shows the results of the bivariate analyses and reveals significant relationships among the predictor and outcome variables. Multicollinearity was not a concern since all of the study’s independent variables were correlated with each other at <0.6 and the variance inflation factor score for each of the three independent variables was <436. The Cronbach’s α value for each study scale was >0.7 and values are shown in diagonal in table 3. Table 4 shows the results of the hierarchical regression analyses. The clinical unit demographic variables, when entered in block 1 of the regression model, explained 18% of the variance in overall perceptions of PS (adjusted R2=0.177, p<0.001). The β coefficients for ICU (β=0.548, p<0.001) and mental health (β=−0.591, p<0.01) in model 1 were significant. These β coefficient values indicate that overall perceptions of PS scores were higher for ICU and lower for mental health compared with the reference category, general medicine. The staff demographic variables, when entered in block 2 of the regression model, did not explain a significant amount of variance in overall perceptions of PS (block 2 ∆R2=0.036, ns in table 4). Senior leadership support for safety, supervisory leadership support for safety and teamwork climate when entered in block 3 of the regression model explained 24% of variance in overall perceptions of PS (block 3 ∆R2=0.244, p<0.001), over and above unit and demographic variables entered in previous blocks. β coefficients for senior leadership support for safety (β=0.360, p<0.001) and teamwork climate (β=0.420, p<0.001) were significant. Finally, the three interactions, when entered in block 4 of the regression model, did not explain a significant amount of additional variance in overall perceptions of PS (block 4 ∆R2=0.015, ns in table 4). However, the β coefficient of senior leadership and supervisory leadership interaction (β=−0.135, p<0.05) was significant. The significant interaction between senior and supervisory leadership is plotted in figure 1. 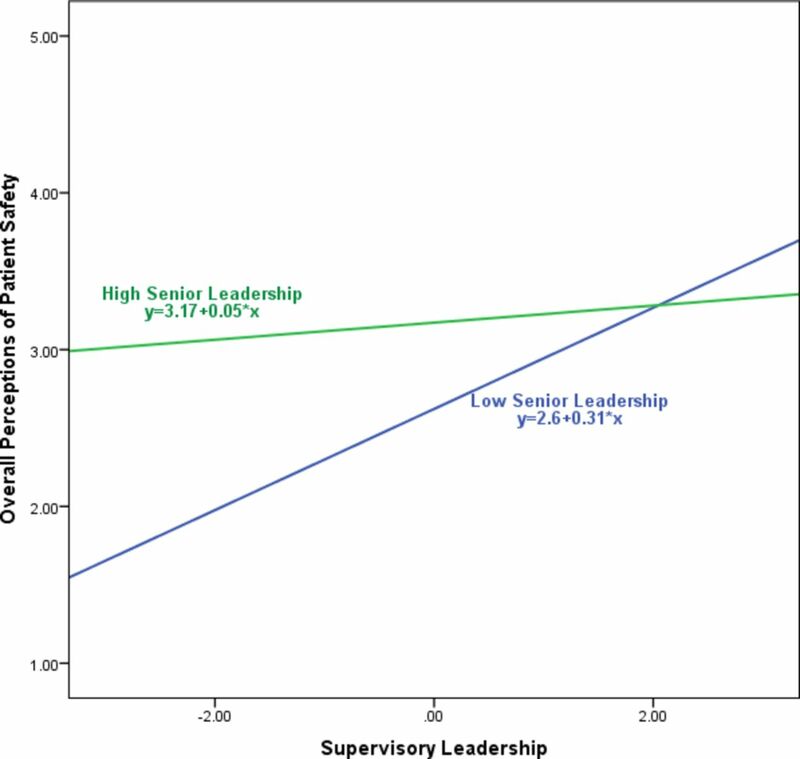 Figure 1 shows the relationship between perceptions of supervisory leadership for safety and overall PS when perceptions of senior leadership support for safety are high and when they are low. It shows that when perceptions of senior leadership support for safety are high, perceptions of supervisory leadership are not associated with overall PS perceptions; however, when perceptions of senior leadership support for safety are low, supervisory leadership becomes an important predictor of overall perceptions of PS. In total, the regression model accounted for 44% of the variance in overall perceptions of PS. Interaction of senior leadership and supervisory leadership as predictors of overall perceptions of patient safety. The survey results only partially supported hypothesis 1. Staff perceptions of senior leadership support for safety were shown to be significantly associated with overall perceptions of PS. However, the direct relationship between supervisory leadership support for safety and overall perceptions of PS was found to be non-significant. Other literature (reviewed above) suggests there is emerging empirical evidence of the positive impact of supportive supervisors on patient40 41 and staff42 outcomes. The survey we used solicited staff perceptions of only two proactive safety behaviours of a supervisor: (a) encouragement of clinical staff to follow established PS procedures and (b) consideration of staff suggestions for improving PS. It is possible, even likely, that clinical staff perceive safety related responsibilities of a supervisor much more broadly—for example, others have suggested that the ability to provide timely feedback for reported errors is seen as a central aspect of supervisory leadership support for safety.43 Future research that operationalises supervisory leadership for safety in a broader way may reveal that this variable has a more pronounced effect on safety outcomes. Our results showed that, compared with being on a general medicine unit, working in ICU was associated with more positive perceptions of overall PS, and working on a mental health unit was associated with poorer perceptions of overall PS. These results are consistent with previous research showing that staff perceptions of domain-specific climates differ between hospital work areas.46 ICUs may attract more resources due to greater case acuity, specialised focus and higher status of physicians and nurses. In contrast, clinical areas such as mental health have been noted for resource scarcity, quality issues and inadequate staff training47—all factors that may lead to negative perceptions of PS. Roots of variation in safety climate across clinical areas should be the subject of further inquiry. Our leadership results may suggest a starting point for practices to raise the safety climate levels in areas such as mental health. Physicians were not included in the current study since only a small number of full-time physicians worked on the participating general medicine and mental health units and physicians are often not physically present on a clinical unit throughout a shift making their recruitment using the study’s data collection procedures difficult. Physicians are also more likely to be informally seen as team leaders by other clinical staff and the current study did not include clinicians in leadership roles. The current study’s predictor and outcome variables were taken from the same survey. Hence, common methods variance is likely to inflate the magnitude of the relationships we examined. Finally, convenience and snowball sampling procedures were used and data come from a single large community hospital. It is recommended that future research test the validity of the current study’s inferences in other types of clinical units (eg, surgery or paediatrics), professions (eg, physicians) and hospitals (eg, small community or teaching) using larger multisite samples. The adult inpatient mental health staff held poorer perceptions of overall PS compared with other clinical units. Mental health units may experience greater threats to staff safety as a result of social and clinical conditions particular to patients on those units.52 There is evidence to suggest that staff on mental health units experience three times as much job-related violence compared with their peers on non-mental health units.53 Our results, along with other empirical research demonstrating resource scarcity and increased risk of violence in these settings, strongly suggest that healthcare managers/leaders must devote more attention and perhaps resources to patient and staff safety on these units. The ‘To Err is Human’26 report highlighted serious quality and safety deficiencies in healthcare delivery systems and in doing so energised healthcare professionals/researchers to design, evaluate and implement safety improvement strategies at the frontlines. Indeed, implementation of standardised clinical interventions—for example, hand hygiene guidelines3 and surgical checklists4—has reduced preventable errors and associated patient harm. There is also increasing evidence of the influence of contextual factors on quality of care and safety outcomes5 27; however, certain literature gaps still remain—for example, an imprecise conceptualisation of multilevel safety climate and a dearth of empirical research on its interactive effect on safety outcomes. The results of the current study suggest that senior leaders’ support for safety and teamwork climate significantly impact nursing, allied health and clerical staff perceptions of PS in an acute care setting. However, when senior leaders provide insufficient support for safety, a supervisor is still able to positively mould front-line staff overall perceptions of PS. This particular finding is noteworthy as it highlights the underexplored compensatory nature of multilevel safety climate where leadership support at one level can counterbalance a lack of leadership support at another level. Our results begin to address some of the organisational safety literature gaps and suggest some contextual aspects of organisations that could benefit from increased attention in PS science. We thank Dr Dennis Raphael, Dr Whitney Berta and Dr Mary Fox for their contributions as members of the oral defence committee for SZ’s PhD dissertation. Most importantly, we acknowledge and thank those in the hospital where this study took place including the Director of Medical Education, Dr Zaev Wulffhart, as well as other senior leaders for their continuous support, the front-line managers on each of the study units for facilitating access to their units, and all of the staff who generously agreed to participate in this study.
. The economics of patient safety in acute care: technical report. Canadian Patient Safety Institute. 2012. http://www.patientsafetyinstitute.ca/en/toolsResources/Research/commissionedResearch/EconomicsofPatientSafety/Documents/Economics%20of%20Patient%20Safety%20-%20Acute%20Care%20-%20Final%20Report.pdf (Accessed 12 May 2018).
. Measuring hand hygiene adherence: overcoming the challenges. The Joint Commission. 2009 https://www.jointcommission.org/assets/1/18/hh_monograph.pdf (Accessed 12 May 2018). World Health Organization & WHO Patient Safety. Implementation manual: WHO surgical safety checklist (first edition). Geneva: World Health Organization, 2008.
. Managing the Unexpected. 2nd edn. San Francisco, CA: John Wiley & Sons, Inc, 2007.
. Doing no harm: enabling, enacting, and elaborating a culture of safety in health care. Acad Manag Perspect 2010;24:60–77.
. Safety climate and beyond: a multi-level multi-climate framework. Saf Sci 2008;46:376–87.
. Organizational culture and climate. In: Kozlowski SWJ , ed. The Oxford handbook of organizational psychology. New York: Oxford University Press, Inc, 2012:643–66.
. To err is human: building a safer health system. Washington, DC: National Academy Press, 2000. AHRQ. Hospital survey on patient safety culture. 2015. http://www.ahrq.gov/professionals/quality-patient-safety/patientsafetyculture/hospital/ (Accessed 13 May 2018).
. Statistics for the health sciences: a non-mathematical introduction. London: SAGE Publications, Inc, 2012.
. Multivariable analysis: a practical guide for clinicians. 2nd edn. Cambridge: Cambridge University Press, 2006.
. Using multivariate statistics. 6th edn. London: Pearson Education, Inc, 2013.
. Hierarchical multiple regression in counseling research: common problems and possible remedies. Meas Eval Couns Dev 2003;39:29–2.
. Applied multiple regression/correlation analysis for the behavioral sciences. 2nd edn. Hillsdale, NJ: Erlbaum, 1983.
. They deserve better: the long-term care experience in Canada and Scandinavia. Ottawa: Canadian Center for Policy Alternatives, 2009.
. Violence against mental health professionals: when the treater becomes the victim. Innov Clin Neurosci 2011;8:34–9. Contributors SZ designed the study, collected and analysed the data, and drafted and revised the paper. LRG, HJW and KT contributed to overall study design, advised on data collection and analysis, and revised and approved the manuscript. LB contributed to study design, advised on data collection and facilitated access to the research site. Ethics approval Ethics approval was obtained from the participating hospital’s ethics board and the Human Participants Review Sub-Committee of York University’s Ethics Review Board (certificate number STU 2016-016). Data sharing statement The data set used during the current study is available from the corresponding author on reasonable request.